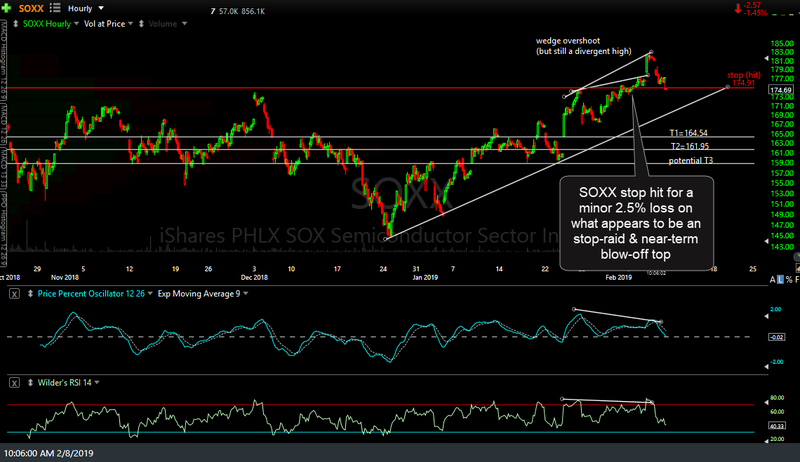 The SOXX (PHLX SOX Semiconductor Sector ETF) short swing trade recently hit the suggested stop of 174.91 for a minor 2.5% loss in what appears to be another brief stop-raid & near-term blow-off top. While that trade will be moved to the Completed Trade category, having hit the suggested stop, the recent high was simply an extension of the existing negative divergences which paves the way for an even larger drop in the semis. Following that apparent buying climax, SOXX went on to break down below the minor uptrend line on the 60-minute chart below and as such, this ETF once again offers an objective short entry & will be added back as an official Short Swing Trade around current levels. The price targets for this trade have been modified with T1 at 167.52, T2 at 164.54 & the current final target, T3 at 159.02. The suggested stop for this trade will be 181.45 with a suggested beta-adjusted position size will be 0.90 (a 10% reduction from a typical position size). 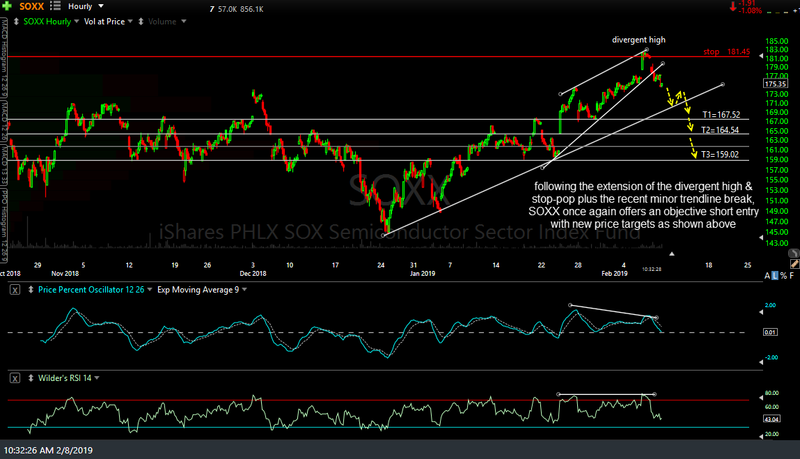 I am recycling the SOXX short, as well as some other short trades that were recently stopped out, simply because the charts are still clearly indicating that a correction is likely. I’ve kept stops tight on those previous trades Semiconductor with the price targets while slightly expanding the targets & stops on the recent trades. This market has been plagued with volatility & what appears to be stop-raids with brief spike above levels that seem to be objective stop levels so while I’ll keep the official stop simple, with any move above 181.44, one might consider using a stop based on either a 60-minute candlestick or daily close above that level to help minimize the chances of being taken out in another stop-pop. Whats the 1x etf short on this or is it only 3x soxs? @rsotc I kinda give more rooms to my Stops, can i have your thought Randy?